The Monitor Arm by Humanscale-M2, offers all the benefits of a traditional flat panel dynamic monitor arm-with none of the shortcomings--the M2 redefines high performance monitor arms. 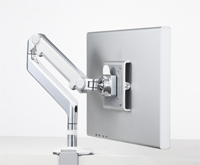 Current-generation single monitor arms utilize a bulky, gas cylinder to support the weight of the monitor. The M2 instead uses an innovative mechanical spring to achieve exceptional performance and durability in a lightweight, ultra-thin design. The M2 is thinner, lighter and easier to maneuver than any current-generation monitor arm, and its sleek aesthetic complements the thin profiles of today's flat panel monitors. With fewer parts than current-generation arms, less can go wrong with the M2 over time. As a result, it’s backed by an industry-best 15-year 24/7 warranty.